House plants are often quite attractive to your cats inspiring digging, munching, and sometimes use as a cat box. This is a guide about keeping cats out of house plants. My sweet kitty just loves when I dig up the dirt to plant my flowerbeds and thinks that she's discovered a new litter box! After trying other methods: sprinkling in hot pepper (nope), cayenne pepper (nope), even adding clam shells into the soil (nope), I tried this. I heard that animals don't like citrus and so after making orange-lemonade (3 oranges, 3 lemons and sugar to a gallon, YUM). I slivered up the peels and sprinkled them around in my flower bed under petals so they didn't show. You may also even add soil to empty citrus fruit peel halves and plant some small flower seeds and use them as pots! It worked! No more kitty visits! I use fruit and veggie net bags to protect my floor plants from my bad kitties that like to dig and leave 'unmentionables' in them. I cut a bag into a circle to fit the diameter of the pot, then cut down the middle. Using clear packaging tape, I tape each side to the rim of the pot up to the base of the plant in the middle. My cats hate the netting and you can water and fertilize right through the net. Here's to loving bad kitties! I have read questions on how to keep cats out of your house plants. Simple, use tin foil. Lay tin foil around the plant on the dirt. Don't push it down onto the dirt or you will start to get some mold. Just lay it on top. Your cats will hate it, and your plants will be fine. Also, they do make colored tin foil if you don't want the plain silver. Simple, but very effective! After years of trying almost everything to stop Brooklyn, our cat, from leaving his deposit in my overwintering houseplants I finally hit on this method which seems to have stopped him in his tracks. If you own pets you more than likely have a disposable sticky roll or two for removing hair from clothing. Simply peel off as many strips as needed. Lay them sticky side up on top of the soil. There is no need to cover every square inch, just place them close enough that your cat has no comfortable room to enter and get squatted. There is enough room to water your plants and if need to easily replace. Works like a charm! Does anyone know how to keep cats away from potted plants? Use some lemon juice in your kitchen, and put the rinds in the dirt. They hate it! Just place orange peels on top of the soil. Cats hate the smell of any kind of citrus. I also used this tip in my flower beds. They wont come near it. Put marbles or glass pieces used in aquariums on top of the soil. Water will still go through and cats can't get to the soil. Spray the cat with water every time it goes near the plant. Let the cat see the sprayer. When you leave the house, put the spray bottle in front of the plant and the cat will leave it alone. At least it worked with our cat. How can I keep a cat away from my houseplants? I've done couple of things that worked for me. On very large pots I have covered the soil with river rocks and glass stones from the craft store or outside. they look pretty too. I also put clear packing tape in a criss cross pattern to cover the whole top of the pot (leave spaces for watering). it even holds when cats walk on it, no harm done. I have heard that pinecones are good to use to cover the soil, but havent tried it. Smaller pots I simply cut out cardboard circle, whole in the middle and cut a slit in it , when put it around the soil to cover it. I place a citrus scented car airfreshner near or in my houseplants. I was desparate. I have not had a problem since. My calico was eating my plants. I tried Febreze, and air fresheners to keep her away. Then I saw the Purina cat food just for indoor cats, and I got that, have been feeding that to her for over a month now, and she has completely stopped eating my plants. There is something in that food that satisfies their urge to chew on plants,if they were inside-outside cats, they would chew grass to get it out of their systems. But my Isabell is inside only, but let me tell you, this stuff works! And it is no more expensive than the regular Purina cat chow. Try it! My house cat (kitten) is getting into my houseplants. He is sitting and digging. What can I do to keep him out? 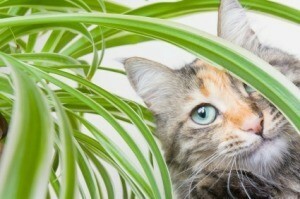 How do you stop cats from pooping in houseplants? Cover the top of each planter with aluminum foil forming it loosely around the plant itself. Also, change your cat litter. The cat seems to prefer the texture and smell of the earth over the texture and smell of your present litter. Try different litters until you find one the cat will use. I am a foster parent for a no-kill cat shelter, and presently have 9 cats. I have 10 litter boxes and 3 different kinds of litter. Some cats use the clumping, some will use only the non clumping clay litter and 2 cats will only use the recycled newsprint litter! None of them like the "super absorbent silicone" litter! Good luck. You may just have to use potting soil in your litter box! I have two 5 month old kittens. The one has started to lay in the plant. He is not digging in it, eating it, or using it as a litter box. He just likes laying in the plant on the dirt. The only thing is he ends up dragging dirt everywhere when he gets out. Is there a way to keep him from getting in my plants? How do you keep cats from digging house plants? I have done this before. I have mixed or buried jacks, the toys you play with, most of the time my cat wont dig when there are pointy objects in there, also they hate orange slices. Hope this helps! Fill it with gumballs from a sweet-gum tree, or pine cones. Set them on sheets of aluminum foil, cats hate the feel and the noise. I have stray and neighborhood cats that spray on my front porch, and also my plants and flowers. They are killing my garden! Does anyone have an idea on how to prevent them from spraying on outdoor plants? I've heard of the pepper and coffee grounds, but I don't think they are sniffing, they just lift and spray. Help! My cousin used moth balls. If YOU can stand the smell, I had a neighbor who would put moth balls in her flower bed to keep her cat from using it. I saw her cat go to the flower bed and he made a "couldn't-stand-the-smell" gesture after smelling the moth balls and walked away. Editor's Note: Please remember that moth balls can be very toxic to pets and put them into something (a mesh bag) so that hey are easy to find when you want to get rid of them. How do I keep my cat out of poisonous house plants? How do I stop my cat from pooping in my indoor plants? He has access to the litter box but digs in the plants and poops in it. My cats did that, too. I finally got rid of my floor plant. You could try making it difficult for your cat to get to the dirt and hope it works. Perhaps put foil around the plant, or criss-cross tape, or mothballs if you can stand the smell. I agree with putting something over the soil (netting or wire), but please do NOT use mothballs. They are toxic to cats and will destroy your pet's liver, even the scent will do damage. Also, once you cover the plant's soil, place the cat's litter box near the plant to encourage the cat to use it, even if inconvenient, you can move it later. You may have to try different types of litter. My cat refuses to use the feline pine stuff, maybe yours is finicky too. If you need to, put some soil in the litter box with the litter until the cat regularly uses it, then cut back slowly on the soil. I had this problem recently with our new cat, Patton. We have several large plants that are on the floor. I put bamboo skewers poking up out of the soil every inch or so, it looked like a forest of skewers. He had no place to sit or walk comfortably. I had no further problems. Be sure to place the sharp part of the skewer down so that your cat doesn't accidentally fall on them. Does ammonia work for cats urinating and pooping in house plants? I would not put ammonia on the soil of house plants. I had a cat that did the same thing and here is what worked for us. How do you keep a cat from digging in house plants? Would anyone know of a cat repellent for my cat? I have numerous houseplants and I do not want him to get sick by chewing on them. Does anyone have any remedies to deter my cats from eating my houseplants/flowers? I love to keep small potted plants and flowers in my home, but my cats love to chew on the them. Need help. I have a kitten and she won't stay out of my house plants. Every morning I find a pile of dirt laying beside the pots where she has been digging. Put orange peels in your potted plants, cats hate the citrus smell. Replace every week when they start to get dry.